Based in Western France, the Tiwal crew is expert in design and in sharing their industrial know-how with over 50 companies to manufacture Tiwal, a high-quality dinghy sailboat. Every part has been designed to resist the stresses of navigation, but also the wind, salt and sand, and nothing less! And because there is nothing like experience, our skippers have clocked up hours and hours of sailing in all weathers to test Tiwal in real conditions, sometimes beyond what is entirely reasonable! Individually, the inflatable hull and aluminium structure both have limited stiffness compared to the major stresses the boat is subject to. 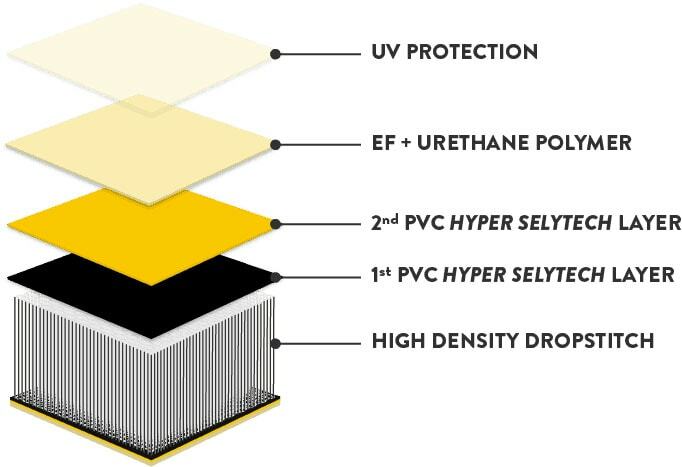 The combination of the two materials gives it structural cohesion and surprising rigidity. This unique patented design makes the Tiwal 3 a real reactive and planing dinghy. 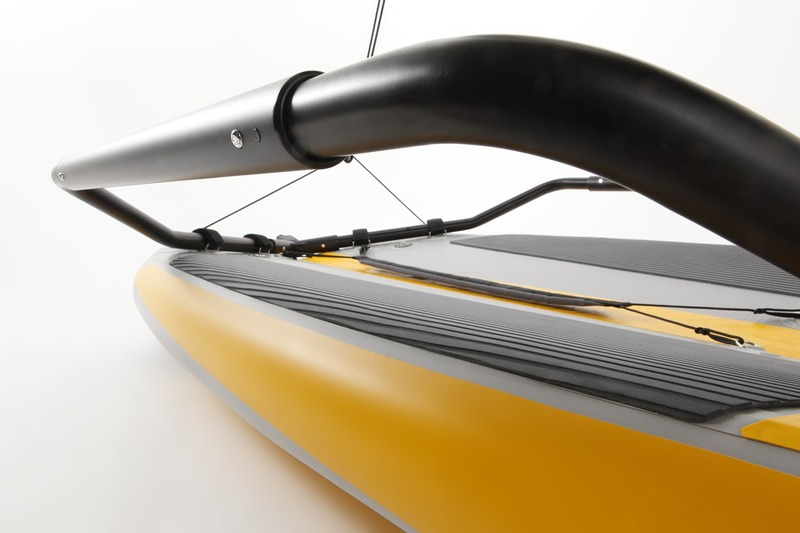 The Tiwal 3 is made from an inflatable 3D textile hull. This hull has two textile sides joined together by numerous threads. This drop-stitch material forms a flat surface that is particularly rigid when inflated to a high pressure. The first innovation in the design of the Tiwal 3 is its hydrodynamic with a V-shaped hull. The drop-stitch sailing boat hull is a patented world first. The aluminum framework is laser-machined for a high degree of precision and to allow fast and seamless assembly of the boat in all circumstances. The combination of the framework with the high-pressure inflated hull confers great rigidity on Tiwal and as a result seaworthiness that is similar to a traditional sailing dinghy. 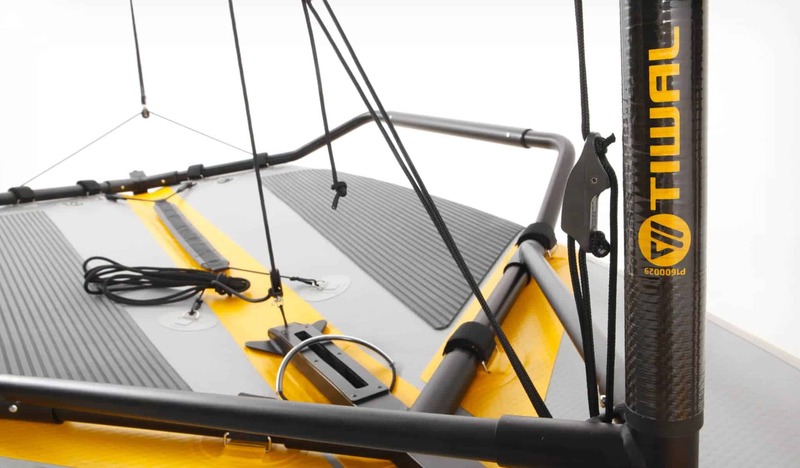 With its carbon mast, TIWAL responds fast and provides fantastic sailing and handling sensations. This is a premium material that can withstand huge stresses and does not baulk at a strong wind. It is sized to allow it to bend in strong gusts. This helps maintain the stability of the boat. The PVC Selytech hull is made by the world leader in this type of inflatable structure, according to our patented technology (US Patent No. 9,694,875, China Patent pending, European Patent pending). This 3.20 m x 1.36 m hull (without its hiking racks) has 2 separate pneumatic compartments (one to starboard, the other to port). The hull is reinforced on the side by a simple chafing strip and underneath with a coating used in rafting boats. This is a really solid hull! 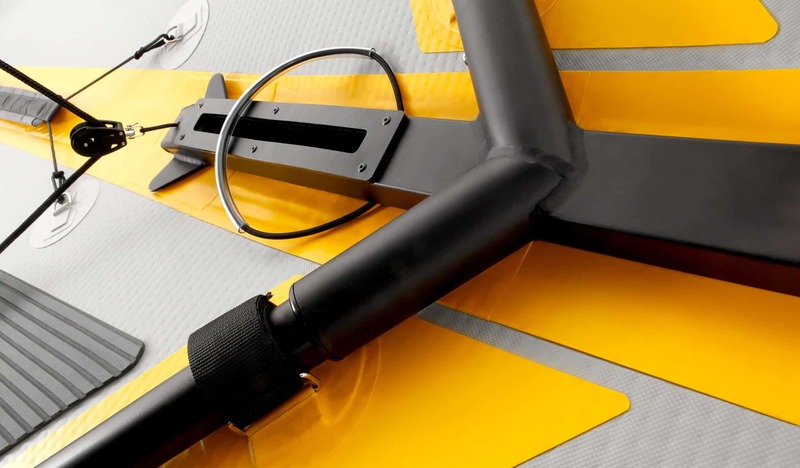 On the deck, EVA foam pads provide a comfortable, non-slip contact with the hull. 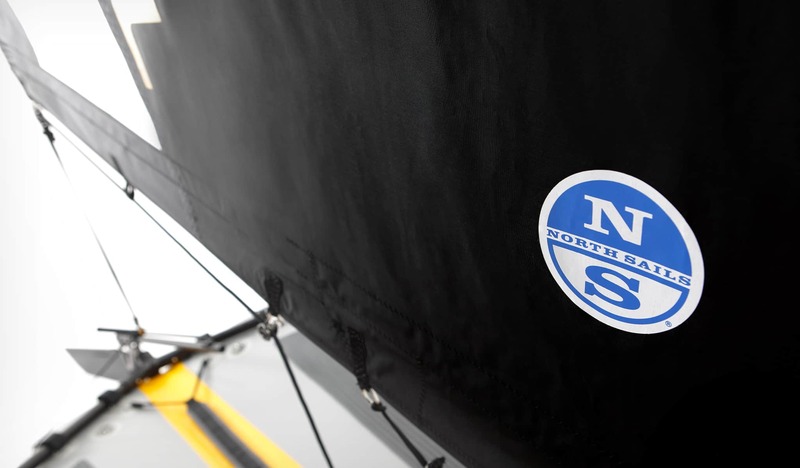 The sail was developed with the help of North Sails, world leader in sail manufacture, particularly for ocean races and the Americas Cup. Its “boomless” design required unique technical developments to guarantee safety for sailors, while at the same time preserving the power needed for a sporty boat. 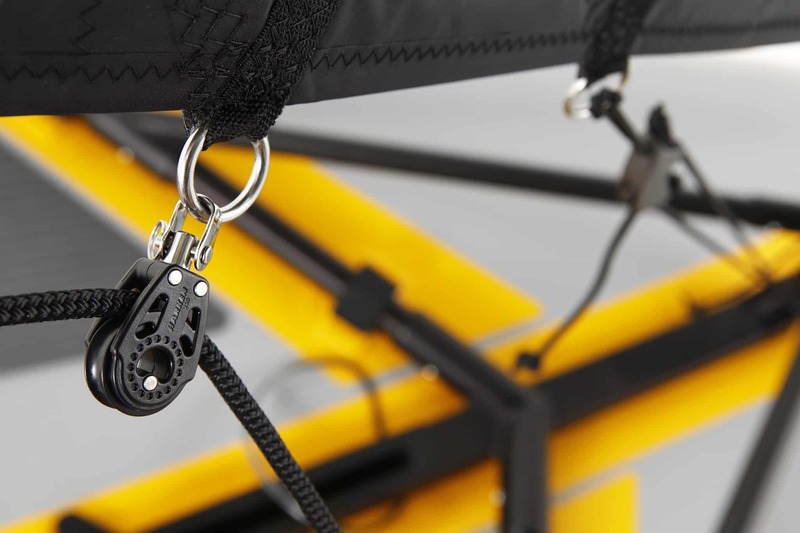 The fittings were naturally entrusted to Harken, also a world leader in this sector.